The Highland Woodworking website has a new exciting addition – now you can search all of our newsletters, blogs, articles and woodworking tips for any woodworking topic you need help with! 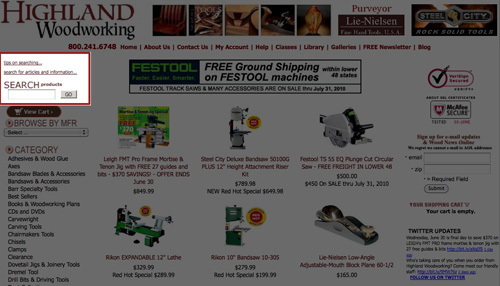 Our informative website just became your best resource for tips, tools and all things woodworking. To access article search from our home page, look on the left side of the page and find the ‘search for articles and information…’ link (right above the Products Search field). Once you click it, it will bring you to the article search page. Type in any topic you need information on, press enter, and there you go – massive amounts of woodworking knowledge at your fingertips. Here’s to more informed woodworking. Have fun with it! Two Minute Safety Tips – we want more! July Wood News just released!